When commissioned to design Boys and Girls’ new work space ABGC was given this quote by Charles Mingus, “making the simple complicated is commonplace; making the complicated simple, awesomely simple, that’s creativity.” Boys and Girls wanted a space that was, “playful but not juvenile.” ABGC had the perfect solution. They created a gallery-like modern space with this gorgeous table as the centerpiece. The table was made out of lego bricks in the same old fashioned way we made pirate ships as kids. They snapped them together without glue, created a relief of the company’s logo in white, assembled a platform on a hollow stainless steel base and topped it all off with a four foot by nine foot slab of glass. Voila, a simple but extraordinary design. I've been following your blog for the week now and i should say we are starting to like a person's post. and now just how do i subscribe to your blog? Apparently you only need 22,742 legos to make a table. 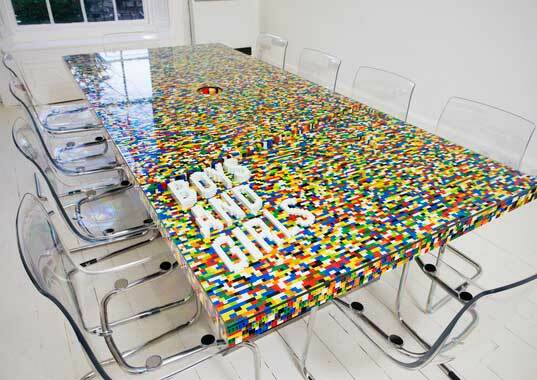 Apparently it only takes 22,742 lego bricks to make a table. After seeing this stunning boardroom masterpiece built by ABGC Architecture and Design, we think we might just strike up a collection! 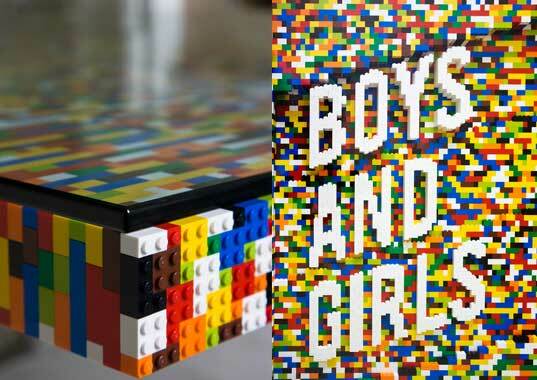 The colorful table was built brick-by-brick for Dublin-based advertising agency Boys and Girls -- when the marvelous idea came to them, ABGC decided, "Why outsource?" After seeing this ABGC Architecture and Design masterpiece -- built for the advertising agency Boys and Girls in Dublin, Ireland -- we think we might strike up a collection. When the marvelous idea came to them ABGC decided, "Why outsource?" They built the table themselves. When commissioned to design Boys and Girls' new work space ABGC was given this quote by Charles Mingus, "making the simple complicated is commonplace; making the complicated simple, awesomely simple, that’s creativity." Boys and Girls wanted a space that was, "playful but not juvenile." ABGC had the perfect solution. They created a gallery-like modern space with this gorgeous table as the centerpiece.